Tom Brady Says This Trick Prevents Sunburns. Science Says Otherwise. Sorry, Tom. Experts say there’s no way drinking water does anything at all to prevent sunburn. Tom Brady, the star football New England Patriots quarterback married to supermodel Gisele Bundchen, saw fit to share his wellness tips in a freshly released book called The TB12 Method: How to Achieve a Lifetime of Sustained Peak Performance on Tuesday. The man is largely considered a perfect specimen of physical fitness. Problem is, some of these tips don’t really consider medical expertise. "When I was growing up, and playing outside in the sun, I got sunburned a lot. I was a fair-skinned Irish boy, after all. These days, even if I get an adequate amount of sun, I won't get a sunburn, which I credit to the amount of water I drink. I always hydrate afterward, too, to keep my skin from peeling. When I once told that to my sister, she said, 'You mean I don't have to use all those moisturizers and facial products to keep my skin looking good? I should just drink as much water as you do? I think you should market your TB12 Electrolytes as a beauty product.' I just laughed." Now let’s debunk this non-truth, step-by-step. Being hydrated has nothing to do with getting a sunburn, or whether your skin peels. However, melanin doesn’t necessarily protect you from skin cancer, says Dr. Sourab Choudhry, board certified dermatologist at Brooklyn Dermatology. Whatever your shade, skin cancer is always a risk when exposing your skin to the sun. Thing is, Brady is all about drinking between 12 and 25 bottles of water infused with “TB12” electrolytes per day (his own brand of electrolyte supplements). Though he exercises all the time and sweats a lot of it out, and some studies encourage athletes to “ingest larger volumes of fluid more frequently” to preserve muscle function and improve performance, too much of a good thing isn’t necessarily so great for the average human. Drinking too much water a day can lead to something called “water intoxication.” According to Scientific American, the water you drink dilutes the salt in your blood. After your kidneys filter the water you drink, you pee it out. When you drink too much in a short period of time, your kidneys can’t keep up and your blood becomes “waterlogged.” So, the water enters other cells in your body, which “swell like balloons.” Thing is, the cells in your brain are contained by your skull and have no room to expand, leading to brain swelling which can put you in a coma, herniate your brain stem, cause seizures and maybe even kill you. Patricia Bannan, registered dietitian nutritionist and author of Eat Right When Time is Tight. says people should be drinking more water than they think, “because an average sedentary person loses about 2.5 quarts of water a day through ordinary activity alone” on her blog. However, what applies to Tom Brady likely won’t apply to the rest of us. “The thing is most people are not working out to the level that Tom Brady is, so their hydration needs are very different,” she told us. 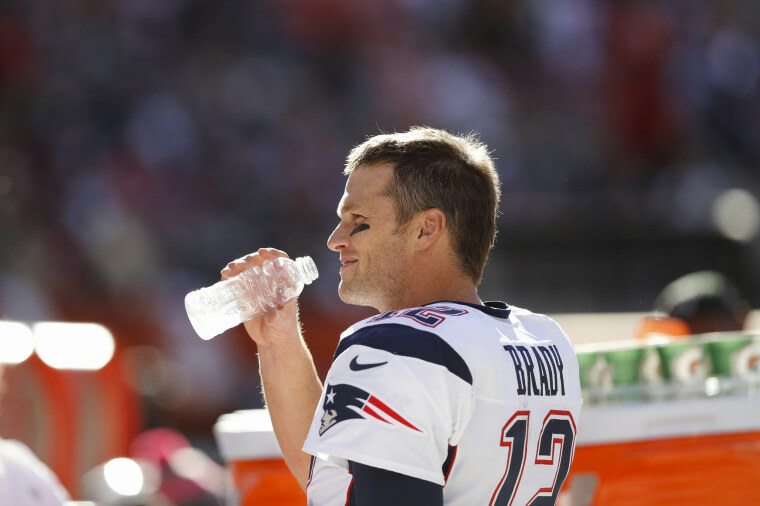 Brady probably endorses the use of electrolytes — including his own blend — because they can prevent muscle cramping. But consuming too many electrolytes can also lead to an electrolyte imbalance, further compounding your problems with symptoms like prolonged vomiting, diarrhea, sweating or high fever, according to the University of New Mexico Cancer Center. All told, you might want to take Brady’s wellness advice about hydrating your way through sunburn with a big grain of salt. And make sure there’s enough of that salt floating around in your blood. As for Tom? He might want to stick to his day job.